You may have already heard that carbon dioxide concentrations have surpassed 400 ppm. The most famous monitoring station, Mauna Loa Observatory in Hawaii, reached this value on May 9th. Due to the seasonal cycle, CO2 levels began to decline almost immediately thereafter, but next year they will easily blow past 400 ppm. Of course, this milestone is largely arbitrary. There’s nothing inherently special about 400 ppm. But it’s a good reminder that while we were arguing about taxation, CO2 levels continued to quietly tick up and up. In happier news, John Cook and others have just published the most exhaustive survey of the peer-reviewed climate literature to date. Read the paper here (open access), and a detailed but accessible summary here. Unsurprisingly, they found the same 97% consensus that has come up over and over again. Cook et al read the abstracts of nearly 12 000 papers published between 1991 and 2011 – every single hit from the ISI Web of Science with the keywords “global climate change” or “global warming”. Several different people categorized each abstract, and the authors were contacted whenever possible to categorize their own papers. Using several different methods like this makes the results more reliable. Around two-thirds of the studies, particularly the more recent ones, didn’t mention the cause of climate change. This is unsurprising, since human-caused warming has been common knowledge in the field for years. Similarly, seismology papers don’t usually mention that plate tectonics cause earthquakes, particularly in the abstracts where space is limited. Among the papers which did express a position, 97.1% said climate change was human-caused. Again, unsurprising to anyone working in the field, but it’s news to many members of the public. The study has been widely covered in the mainstream media – everywhere from The Guardian to The Australian – and even President Obama’s Twitter feed. Congratulations are also due to Andrew Weaver, my supervisor from last summer, who has just been elected to the British Columbia provincial legislature. He is not only the first-ever Green Party MLA in BC’s history, but also (as far as I know) the first-ever climate scientist to hold public office. Governments the world over are sorely in need of officials who actually understand the problem of climate change. Nobody fits this description better than Andrew, and I think he is going to be great. The large margin by which he won also indicates that public support for climate action is perhaps higher than we thought. Finally, my second publication came out this week in Climate of the Past. It describes an EMIC intercomparison project the UVic lab conducted for the next IPCC report, which I helped out with while I was there. The project was so large that we split the results into two papers (the second of which is in press in Journal of Climate). This paper covers the historical experiments – comparing model results from 850-2005 to observations and proxy reconstructions – as well as some idealized experiments designed to measure metrics such as climate sensitivity, transient climate response, and carbon cycle feedbacks. For a long time I have struggled with what to call the people who insist that climate change is natural/nonexistent/a global conspiracy. “Skeptics” is their preferred term, but I refuse to give such a compliment to those who don’t deserve it. Skepticism is a good thing in science, and it’s not being applied by self-professed “climate skeptics”. This worthy label has been hijacked by those who seek to redefine it. “Deniers” is more accurate, in my opinion, but I feel uncomfortable using it. I don’t want to appear closed-minded and alienate those who are confused or undecided. Additionally, many people are in the audience of deniers, but aren’t in denial themselves. They repeat the myths they hear from other sources, but you can easily talk them out of their misconceptions using evidence. I posed this question to some people at AGU. Which word did they use? “Pseudoskeptics” and “misinformants” are both accurate terms, but too difficult for a new reader to understand. My favourite answer, which I think I will adopt, was “contrarians”. Simple, clear, and non-judgmental. It emphasizes what they think, not how they think. Also, it hints that they are going against the majority in the scientific community. Another good suggestion was to say someone is “in denial”, rather than “a denier” – it depersonalizes the accusation. “What should I call myself?” is another puzzler, since I fall into multiple categories. Officially I’m an undergrad student, but I’m also getting into research, which isn’t a required part of undergraduate studies. In some ways I am a journalist too, but I see that as a side project rather than a career goal. So I can’t call myself a scientist, or even a fledgling scientist, but I feel like I’m on that path – a scientist larva, perhaps? I returned home from the AGU Fall Meeting last night, and after a good night’s sleep I am almost recovered – it’s amazing how tired science can make you! The whole conference felt sort of surreal. Meeting and conversing with others was definitely the best part. I shook the hand of James Hansen and assured him that he is making a difference. I talked about my research with Gavin Schmidt. I met dozens of people that were previously just names on a screen, from top scientists like Michael Mann and Ben Santer to fellow bloggers like Michael Tobis and John Cook. I filled most of a journal with notes I took during presentations, and saw literally hundreds of posters. I attended a workshop on climate science communication, run by Susan Joy Hassol and Richard Sommerville, which fundamentally altered my strategies for public outreach. Be sure to check out their new website, and their widely acclaimed Physics Today paper that summarizes most of their work. AGU inspired so many posts that I think I will publish something every day this week. Be sure to check back often! I apologize for my relative silence recently. I am in the midst of studying for my first set of final exams. To tide you over until that has calmed down a bit, I will share some of the interesting pieces I have read and watched recently. My study break today was spent watching a fantastic video that Peter Sinclair recently dug up. It’s an hour-long talk by Dr. Ben Santer (see my recent interview with him), with an introduction by the late Stephen Schneider and questions at the end. He tells a very troubling story about “science, non-science and nonsense”. Lots of great quotes in there – I highly recommend giving it a watch. John Cook from Skeptical Science has compiled his articles and rebuttals into a gorgeous document about the evidence for anthropogenic climate change, written in accessible language with effective graphics on every page. It’s so effective, I would like to print out a few dozen of these booklets and hand them out at the university. 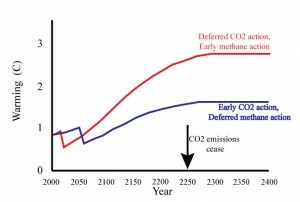 Michael Tobis, however, thinks that we should focus on non-CO2 emissions despite these realities. Short-term economic and population “crashes” due to sudden warming in the near term could conceivably be more damaging to human security, because it means that we won’t be able to afford any mitigation, further worsening the long-term emissions. Both articles are worth a read. Well, off to go memorize organic functional groups. Enjoy!